I've created a monster. 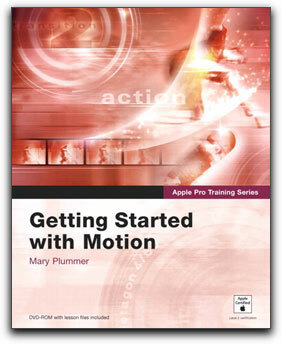 Sitting on my desk is the newest book hot off the Peachpit Press, Getting Started in Motion, an Introduction to Motion Graphics by Mary Plummer which is a part of the Apple Pro Training Series. My fiancé, Bets, who wouldn't know a dissolve from a cut and who has never heard of Final Cut Pro, whose claim to fame with a camcorder is an astonishing ability to aim it at the subject's kneecaps, picked up Getting Started in Motion and has since not left the computer in 3 days. After installing and copying the media files supplied with the manual and showing her where Motion could be found in the dock, she has been digging through it like a hot knife through butter. After all, if this book is worth its salt it should do what it says it will; provide a thorough understanding of Motion to the complete beginner and beyond. For those new to Apple's Motion, or for those who have not had the opportunity to explore its' myriad possibilities, Getting Started in Motion serves as an important prologue to the main event of the Apple Pro Training Series for Motion. Mary Plummer provides an excellent book containing a bevy of guides, tutorials and important information designed to get you comfortable enough with the application to fly under your own steam. The media files alone add 2.42 gigs of file projects, images and animations to your desktop. There is quite a bit here to work with. The eleven chapters nicely cover the gamut of Motion's capabilities started with Working with the basic interface, Creating Motion Graphics and Working with Layers, Behaviors, Filters, Masks, Particles, and Text. Then, taking the natural sequence of learning further along while working with Generators, Audio and Keyframing basics, Managing Media and Importing and Exporting your projects. Each lesson provides both finished projects to see what you hope to create, as well as the media necessary to produce your own. This manual also contains abundant and attractive illustrations and photos in full color. My only complaint is that the shots of settings used in the inspector are a bit small making it a trival difficult for my old eyes to read. Never the less, the suggested settings are always supplied in print and that is really all that is necessary. Of course, Mary Plummer strongly urges the user to experiment with different applications, settings and uses for the projects as well as consistently showing the variety of techniques that one may apply. Peachpit Press's Getting Starting in Motion does what it is supposed to do; guide the new user through a learning curve made easier by the sequential raising of the bar of skills that each new lesson and project demands. You'll have to excuse me now as Bets is punching me in the arm, Getting Started in Motion in hand, itching to get back to it.